The wreath shown above contains real blown eggshells from barnyard fowl raised right here in Central Illinois. 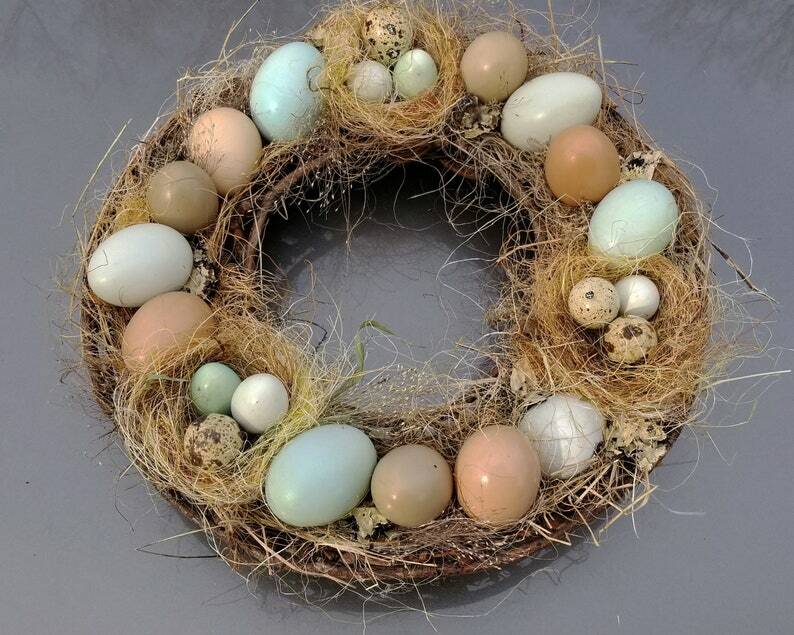 Duck, quail and chicken eggs in both natural and softly enhanced colors are set in a bed of fibers, grass, and moss and fitted into a round rustic 13 inch frame of wire and vine. This wreath will last for many seasons indoors. It is a distinctive addition to any hearth, wall, or door and makes a perfect all season centerpiece when laid on a table. The wreath shown above is representative of the one you purchase. I try to reproduce these faithfully from the above samples, but slight variations always exist. Email me if you would like a photo of the actual wreath you will receive. 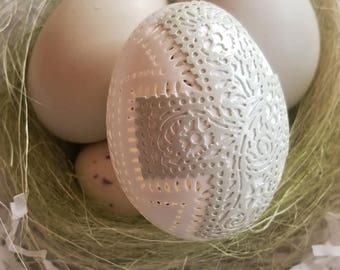 Please note that although several coats of a clear UV shield have been applied to these eggs, they are natural elements and will degrade with prolonged exposure to the elements. For this reason, I recommend this wreath be protected from inclement weather or enjoyed as an indoor ornament. 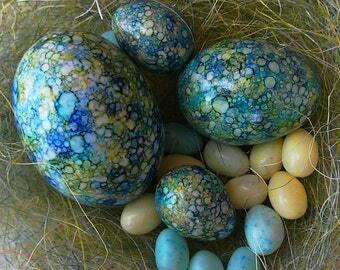 Beautiful - this will be my Easter centerpiece with a pillar candle in a hurricane jar. Very carefully packed. Highly recommend this seller. Very quick and nicely packaged for shipping... the containers included for storage after Spring are much appreciated! 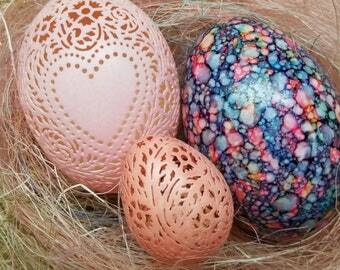 The eggs are very beautiful! 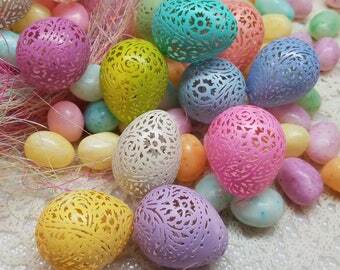 Beautiful egg, great packaging for shipping PLUS secure packaging for year to year storage. 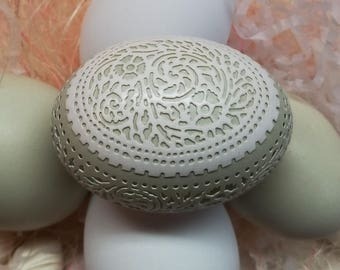 This beautiful egg arrived today with such beautiful packaging. This would make a wonderful gift the way the artist mails these out. (The post office managed to crush one side of the package labeled "fragile", but the egg was safe inside.) I'm displaying it in a vintage demitasse cup in the photo.